News › Stories › Archives › 2017 › February › Groban Joins Alumni Duo To Star in "The Great Comet of 1812"
Josh Groban and Denee Benton are starring in the "Great Comet of 1812." 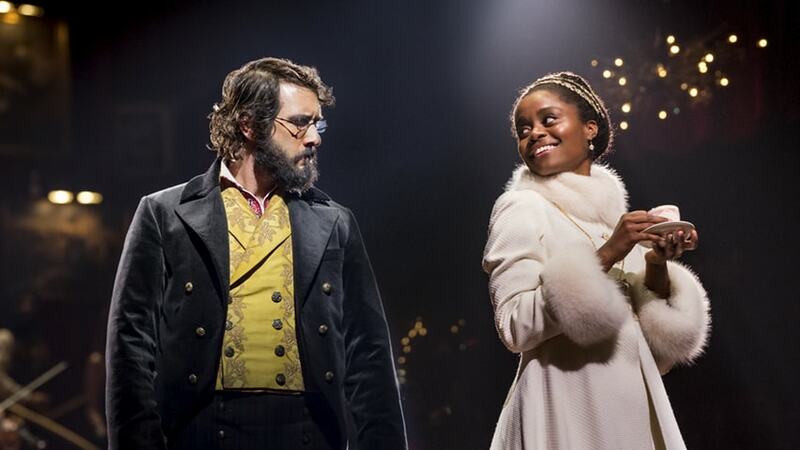 The road to Broadway can be a varied and winding path, a truism for "Natasha, Pierre and the Great Comet of 1812" and its cast, which includes Carnegie Mellon University alumni Josh Groban, Denée Benton and Paul Pinto. For Pinto, a 2004 graduate of the School of Music who plays the wild Troika-driver Balaga, this journey began with "The Great Comet," originally produced in a tent by the off-Broadway company Ars Nova. The immersive musical was workshopped and written by Dave Malloy, directed by Rachel Chavkin and mounted in October 2012. It opened on Broadway in previews last fall. The musical centers around a 70-page excerpt from Leo Tolstoy's "War and Peace," in which a young woman joins her godmother in Moscow to make her debut to society. Forbidden love, jealousy, treachery and redemption ensue. New York City's Imperial Theatre has been transformed to reflect the intimacy of the original production, and every bit of the space is alive with performers and scenery — musicians, dancers and actors traverse flights of stairs with athletic mastery. "It is exactly as hard as I thought it would be," said Groban, who made his Broadway debut in the title role of Pierre, a chubby misanthrope who yearns for meaning and purpose. "I came in with a lot of stamina from my grueling concert schedule. But this is a different kind of grueling because it's more emotional." Not to mention taking on all the stairs in a fat suit. Groban studied music theater at Carnegie Mellon's School of Drama for six months in 1999 before beginning his career as a recording artist in earnest, but the friendships he built with classmates, including Leslie Odom, Jr., Rory O'Malley and Josh Gad, all 2003 graduates of the School of Drama, were lasting. "The thing that I love about theater and my time at CMU is that it taught me to be a cog in a great wheel," Groban said. "I was super run down, and I wouldn't have been able to do it if it weren't for the other students. To have that kind of community and camaraderie in a professional show doesn't feel that different from when we were in school. It was pivotal." For Groban's co-star, Benton, playing the young, naïve Natasha Rostova in "The Great Comet" is almost poetic. Her journey to Broadway has been meteoric, taking on the Great White Way just two years after graduating from the School of Drama in 2014. She joined the production in 2015 with its remount at the American Repertory Theater in Cambridge, Mass. Benton spoke about the intense athleticism required to perform this piece. "For me it's still a lot of prayer. I've been going to a physical therapist and chiropractor and would practice my songs while walking up and down stairs. It really is conditioning and dealing with the exhaustion until you gain some stamina," she said. Stamina, it seems, likely will be required as the buzz about "The Great Comet" doesn't seem to be diminishing and awards season approaches, with The New York Times calling it "the most innovative and best new musical to open on Broadway since 'Hamilton.'"